Today's '10 of the best' post focuses on cutlery. A well designed cutlery set is for life, not just for the Christmas.... and it doesn't have to be all about stainless steel. Black, dip-dyed and even (dare I say it) gold cutlery sets are all vying for my attention right now. Enhance your everyday dining experience with some seriously stylish flatware. Here are 10 of my favourites. Bon Apettit! Above: Burlo 24 piece satin finish stainless steel cutlery set - £65 from Habitat. Matt steel cutlery set with black handles by Jesper Stahl for Design House Stockholm - from £16.50 per piece Houseology. House by John Lewis satin finish everyday cutlery set - £25 for a 16 piece set at John Lewis. Living by Christiane Lemieux Herringbone cutlery set - £120 for a 24 piece set House of Fraser. Cutipol copper cutlery set - £257 for a 24 piece set from Amara. Sambonet Gio Ponti polished stainless steel cutlery set - £60 for a 4 piece setting at Houseology. Gold-dipped cutlery set - £32 for a five piece setting from Anthropologie. 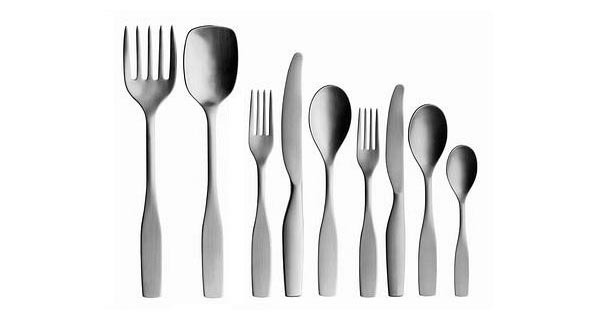 Citterio 98 cutlery set by iittala - from £5 per piece at Skandium. Malvern cutlery set by Robert Welch - £195 for a 56 piece set. Villeroy and Boch brushed stainless steel cutlery set - £175 for a 24 piece set from House of Fraser.